It was true before Harold & Kumar, but the 2004 surprise-hit film confirmed what many of us know: White Castle is glorious food while you’re high. When one becomes numb and giggly, one does not seek subtle notes or layers of complexity. White Castle’s stoner appeal is that it’s one-note—a primary color, a C-major chord—tasting like hand-held French onion soup. The griddled onion is, indeed, the marquee player: Its sweetness colors every other taste. The beef is more spreadable disc than patty, so flimsy and thin it’s more an evocation of meat than a physical presence. The buns are so warm and luxuriously pillowy you could fashion 250 sliders into a Tempurpedic mattress. A White Castle slider is essentially baby food for grown-ups. Which makes White Castle getting into business with Impossible Foods, makers of the plant-based Impossible Burger, a curious but intriguing collaboration. The Impossible Burger—based in Redwood City, California in the cradle of Silicon Valley—has received much notoriety as the patty that “bleeds.” Well, not really; it’s a wheat and potato-based product that employs heme, the molecule responsible for making meat taste and smell like meat. At White Castle, the Impossible Burger takes the form as a slider with smoked Cheddar, griddled onions, and pickles, clocking in at a surprisingly high 300 calories (while it’s cholesterol-free and vegetarian, the Impossible Burger has as much fat as a similar-sized 80/20 ground beef patty). The key figure here is 90 percent. 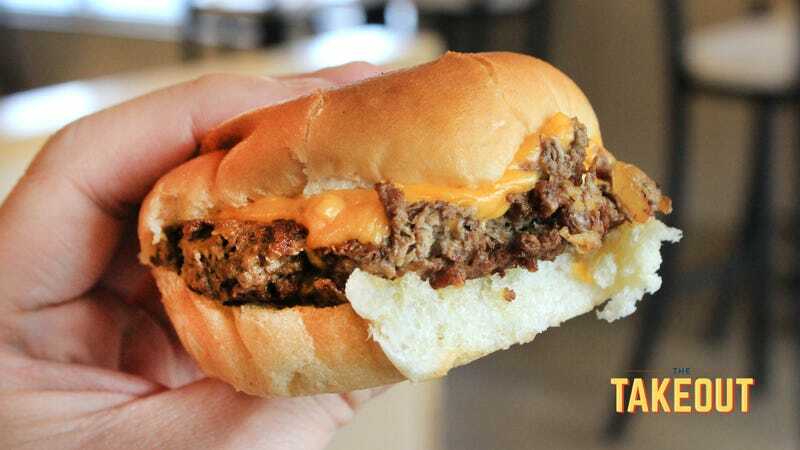 If a standard White Castle slider is the baseline, the Impossible Slider gets it there 90 percent of the way—it’s an adequately pleasurable mini-hamburger, but you can’t but help noticing something is slightly out of tune. Texturally, the White Castle flattop helps achieve that crisp edge; the patty crumbles like ground beef, though the interior “meat” (especially when cooled to room temperature) becomes springy and even squeaky. The flavor evokes beefiness on cursory bites, but, upon more thoughtful chews, begins to taste a bit like seasoned wheat bread. Nevertheless, The Impossible Slider feels wholly White Castle. It arrives in a cardboard sleeve, the buns sliding out fluffy as ever. As a point of comparison, I bought one of White Castle’s original veggie slider, and that tastes like a falafel sandwich. With the veggie slider, though, it has no illusions about being something else. The Impossible Burger is performing a cover version, even if it’s 90 percent faithful to the original. Remember: A standard White Castle slider isn’t about beef in the starring role. So goes The Impossible Slider. The cheese and onions help disguise any meaty subterfuge, though not fully, but the misdirection is effective. Your mind can’t help but go searching against prior beef reference points, looking for that 10 percent that’s not quite meat. It’s impossible not to. White Castle’s The Impossible Slider is available for a limited time only at 140 New York, New Jersey, and Chicago-area locations.